Talk about dimensions. That’s eleven massive glass panels with a huge Apple logo in the dead centre — where a very Chinese poem (in calligraphy no less!) used to be earlier this month. Welcome to the West Lake Apple Store just off Longxiangqiao Metro station — with a very Chinese characteristic: the two characters for West Lake on a billboard. The general public can see the store in “public beta” right now: they can’t get in but they can see staff training on the ground floor. The store open will at 09:00 local time on 24 January 2015, when this store will replace the Beijing Wangfujing store as the largest in Asia. Also being promoted right now is the new Brushes 3 app, along with iPad Air 2, as well as the iMac and the iDraw app. That promotion is in the form of a picture — a Chinese tapestry — of street views of the old Hangzhou, in full colour, making it a very Chinese store indeed. Unlike its meaning in the West — indicating alarm, distress, or ideologies of repression — the colour red is synonymous in China with joy and good luck. In a final touch of this store being a very Chinese store, all staff were seen on pictures carried by mainstream Chinese tech sites, including Zhejiang Online, as wearing red instead of the usual blue. 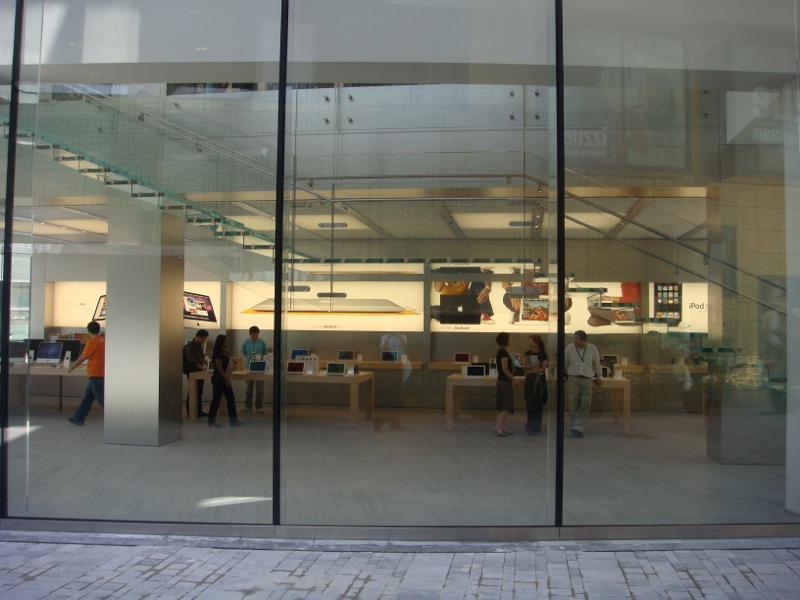 The picture shown in this article is the Sanlitun Apple Store in Beijing.